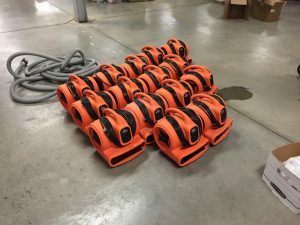 Homeowners living in southern California can stay calm during a water disaster knowing that the water damage Los Angeles pros at 911 Restoration Los Angeles will be at their property within 45 minutes, fully equipped with the latest water extraction technology to get started restoring your home. Our water damage Los Angeles crews know that it is important to act fast during water disasters, so we consistently offer same day services so you never have to wait long for help. Our water damage Los Angeles team also works with IICRC certified technicians to make sure you get the best service. Call us anytime, because our water damage Los Angeles offices keep our staff available 24/7/365 in order to keep you safe day and night. Take the time to check on the pipes around your property to make sure there is no rusting or corrosion that may lead to a pipe burst down the road. Trim the trees around you property from time to time to ensure that any dead limbs don’t threaten to fall onto your roof during the next major storm. Let a restoration expert come and inspect your property for any trouble spots that may develop into water damage situations when put under pressure or time. Check on the hoses, fittings and connectors that link up your water-based appliances to the main line as these can fail over time. 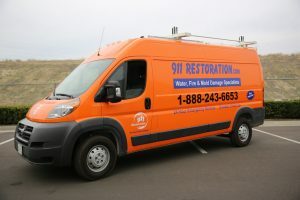 There are a plethora of different kinds of water damage and ways to prevent it, so if your home is experiencing any of the above, or if you’d like to know more about how to prevent such things, then contact our water damage restoration Los Angeles crew with 911 Restoration Los Angeles for help today! With high heat summers, and windy days, there is a lot of room for brush fires in Los Angeles. The thing about them is that they have high splash damage. Which means that the extent of their reach goes far beyond that of the area of occurrence. For example, if a small fire were to happen on a hillside by your home, then it is likely that the fire department will hose your living space down to prepare it for possibility that it may also ignite. Even if it does not, then you are still faced with the ash the wind blew into your yard, and the smoke stains left behind. For these reasons, 911 Restoration Los Angeles is a full service repair team for all the ailments that a fire may breed. If your property has suffered a recent fire outbreak event, then contact our fire damage restoration Los Angeles team with 911 Restoration Los Angeles today! The drought will force trees and shrubs to penetrate deeper into the earth in search of water. The root systems are highly aggressive, and they will get into older pipes made up of heavy metals. When they do infiltrate them, that is known as root invasion. With the integrity of the lines compromised, it can result in sewage backup. This is classified as a category 3 water damage incident, and a homeowner should never attempt Do It Yourself remediation. 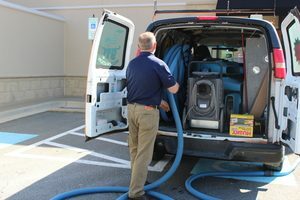 As the high microbial load can make the unprepared ill, we recommend calling experts such as those at 911 Restoration Los Angeles. We arrive in a prompt manner with the tools that extract the waste, dry the space, and sanitize it. No odor or stain will remain, thus providing you with the peace of mind you deserve. Don’t let category three water ruin your lovely home. 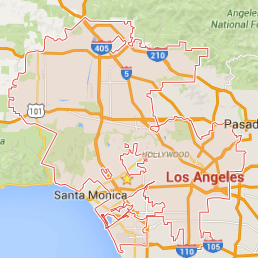 Contact our sewage backup cleanup Los Angeles team with 911 Restoration Los Angeles for expert assistance today! Los Angeles residents are no strangers to what is like living in earthquake country. Even after providing additional seismic-proofing, a lot will move when the earth shakes. Things such as cast-iron, copper, and PVC pipping are rigid. Every year the ground subsides, rises, or shift laterally. Therefore, the pipes stiff structure warp in ways they were never meant to, which will result in a water and structural damages. When this happens, you can trust in 911 Restoration Los Angeles to be there for you. In our years of experience, we have seen it all. From the 1972 San Fernando quake in Sylmar to the 1994 Northridge one, we were there for the citizens of Los Angeles. If your property has recently gone through any sort of major crisis, then contact our disaster restoration Los Angeles team with 911 Restoration Los Angeles for help today! As explicated early, we can handle more than just water damage. This includes its effects as well. 911 Restoration Los Angeles receives a huge influx of calls as a result of things happening due to untreated water damage. As soon as an accident happens, we recommend calling us because we never want you to experience compounding problems. A mold colony will increase the number of naturally occurring mold spores in the air, thus leaving plenty of room for you to experience its nauseating effects such as: headache, eye irritation, congested nose, and other respiratory issues. In order to provide you peace of mind, then you need to be able to breathe comfortably in your home. Our technicians will provide you with a thorough water restoration job, so that you never experience these symptoms as result of mold. If you do have a colony growing in your home, then we will perform a decontamination job that will fix things right up for you. 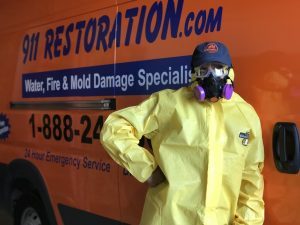 So, if your property is starting to smell musty, then contact our mold removal Los Angeles crew with 911 Restoration Los Angeles and they will be there to help today!